\r\nHopefully, "today" meant today and henceforth ... We\'ll see tomorrow, I suppose. Could someone mail me the I/Q or wav file from Dream? I woud like to run the file on my setup here. Thanks in advance. Please send me a private message here above. \r\nThank you for the information, it is most appreciated! Could someone mail me the I/Q or wav file from Dream? \r\nI/Q file posted in the 15110 kHz thread. A result for 45 mins. No audio...due to lack of xHE-AAC decoder. I/Q file posted in the 15110 kHz thread. Thank you John for the files you sent. I used the "20-34-33" and "19-37-37" and they played nicely on the GR-216. The Avion was trickier to use, mainly because of the receiver\'s peculiarities. But both produced audio. The Gospell locked up to the signal very quickly while the Avion took its good time to react. \r\nThe audio frequency range ended around 13600 Hz. The first file was a woman singing something like "rap" in English, and the second file was spoken English about sports and then a piece of music from the region. \r\nThe image shows what comes out of the earphone jack in the GR-216. \r\nWhat are the parameters used for the xHE-AAC transmissions? Bitrate and so forth? \r\nplease find a screenshot of the content server settings. Monitoring through several countries through Europe through sdr.hu website, there was no signal from the station today. I regularly tuned to Radio Kuwait in Brazil from August to December 2017: Full Program https://www.youtube.com/watch?v=FeRAJsHNHAA&t=191s . \r\nThis year the signal has not been good here, I could only tune the station to 13650 kHz last month: https://www.youtube.com/watch?v=L4aR142OKeY&t=585s . \r\nI acquired an Avion receiver, if the propagation improves here, I will be able to tune the station with the new codec, although it would be more likely to tune in with the Morphy Richards Receiver, which has better tuning than the Avion, but does not have an update to the codec xHE- AAC. \r\nCordial 73 from South of Brazil! \r\nI strongly suggest the use of 16-QAM modulation in the MSC - Main Service Channel, which will decrease from 16 to 9dB MER the minimum gain for listeners to hear the signal with fewer faults, great goal of the xHE-AAC codec, since it will be possible to listen with great quality, even stereo, with 16-QAM. Naturally, I second Clint\'s suggestion of switching to 16 QAM modulation since it would increase the chances of long distance listeners\' ability to decode and record the audio. However, I\'m impressed that Ampegon is testing the xHE-AAC codec at all. \r\nBTW, I didn\'t decode any audio despite indications otherwise. \r\nI\'d certainly rather see the resumption of R. Kuwait on 13650 kHz with 16 QAM modulation, 350 degrees azimuth, and the xHE-AAC codec. Keep PS. Why do I want Ampegon to keep PS with 16 QAM modulation? Because, the implementation of PS in xHE-AAC is clearly superior to the one in HE-AAC. Yes, the operation was a success but the patient died! Thankfully, there\'s a cure, but it might require some money ... like everything in life. Strong signal registered in southern Brazil yesterday and saturday (MER MAX 22dB). However I am with Morphy Richards only at my parents\' house. Tomorrow I will go to my house, where I can count on my Avion receiver to be able to decode the audio. But it\'s great to see that Kuwait is back with great signal in Brazil. I know there are 3 people, besides me, with Avion receivers here in Brazil. As soon as I can decode, I want to broadcast in a DXista program that aired all over Brazil and around the world, in the shortwave of Radio Aparecida. \r\nFabulous idea ... Personally, I\'m looking forward to your recordings. Fabulous idea ... Personally, I\'m looking forward to your recordings. \r\nI sent a couple of minutes of xHE-AAC audio to Per. Perhaps he will help me to upload it somewhere for you guys to listen to. I sent a couple of minutes of xHE-AAC audio to Per. Perhaps he will help me to upload it somewhere for you guys to listen to. \r\nIf you use Firefox as browser, right click on the link and then save link as. \r\nSome signal registered today in Brazil. With the Avion receiver, I could see the name of the station, unlike the Morphy Richards that does not decode the name of the radio, because it is incompatible with the new xHE-AAC codec, although it is just an audio codec. This week I could not hear before, because I was at work. Today was cloudy, tomorrow is forecast to rain and maybe on Sunday, with the forecast of being sunny, it might be possible to make a good record here. TIA for the effort. I\'m looking forward to those recordings. BTW, how much does the DR-1401 cost in US dollars ... include the shipping cost to SA. An approximate figure would be just fine. Without shipping, at the current exchange rate, the retail price seems to be ~ $210. \r\nAt the beginning of the year I bought for about U$ 280, from a friend in Brazil who had bought the receiver but had difficulties tuning to DRM stations in his city. 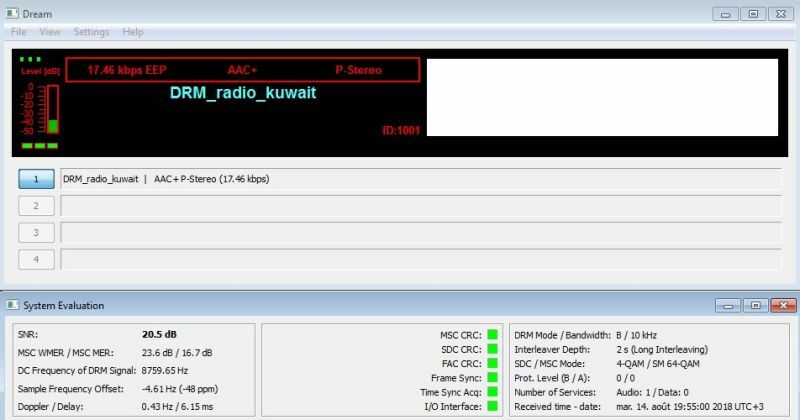 Well at the time I was having problems with Uniwave due to an update for it to work with xHE-AAC, but that did not work since it was a Diveemo receiver, according Alexander Zink, DRM vice chairman of DRM. Then I was able to rescue by getting in touch with the Uniwave servant. My old MR was also having trouble with the menu button. I sold and bought a new one later. Anyway today I have Uniwave, MR and Avion, and only Avion is compatible with xHE-AAC. I hope Titus will be marketed in 3 months, as a chinese told me on my Youtube channel. Low signal at 18h UTC. This afternoon\'s reception - 26.89% audio decoded, 18.65 dB max SNR. \r\nThe receive antenna was damaged by a storm recently and half of it is laying on the ground. \r\nYes, propagation over the past 5 days or so has been excellent in contrast to previous months. This afternoon's reception - 26.89% audio decoded, 18.65 dB max SNR. The receive antenna was damaged by a storm recently and half of it is laying on the ground.